I mentioned yesterday that I needed a couple of male birthday cards right after Christmas - this is the one I made for my Dad. 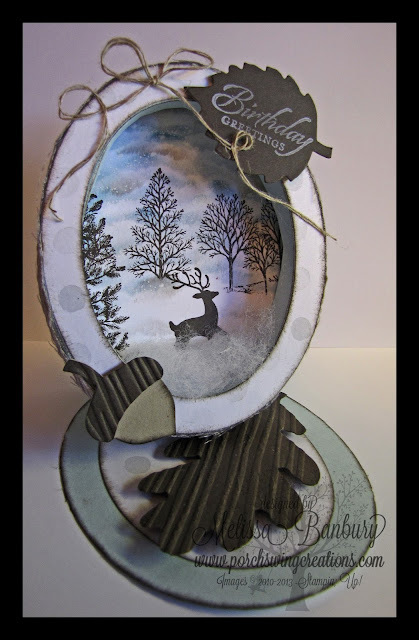 I had been looking through the Splitcoast Stampers gallery and came across a square shaped shadow box easel card (whoa...say that three times fast!) and decided to give it a go using my Oval Framelits. This type of card is by no means a "quick" card - the making of the shadow box is a little tedious, along with the layering, but this card looks so pretty in real life! It also doesn't fit into a regular sized envelope but if you have an envelope punch its easy peasy to make a custom envelope. If you are familiar with the layout of an easel card, this card is not much different. 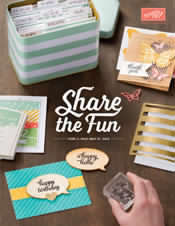 Instead of adding your stamped image on the stand up easel portion you switch it out for a shadow box of the same shape. I love the way it frames an image. 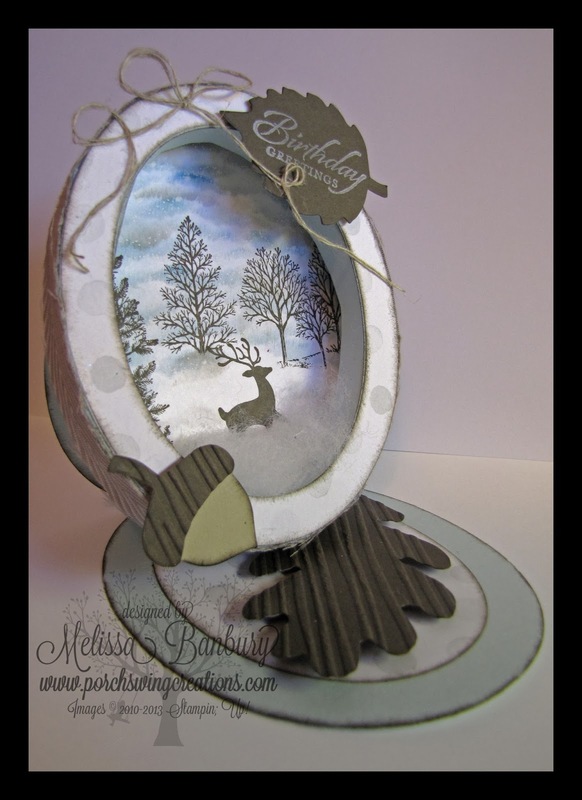 In this case I decided on the size of the card, cut out all the working mechanical pieces, then cut another piece of Whisper White cardstock to the largest size oval I was using then worked on stamping my images. The background I sponged and stamped is quite similar to my Silent Night card I created a while back although in this case I chose to use the Lovely as a Tree set and sponged the sky and clouds with softer colors. Once I assembled all the pieces I glued a small amount of Fiberfill to the bottom of the stamped scene to add a little texture and the look of fluffy snow. A strip of Smoky Slate Chevron Ribbon tidies up the edges of the frame nicely. The leaves from the Autumn Accents die add a finishing touch and act as the "holder" for the stand up portion of the easel. Well, that's all for 2013! Thank you to all who stopped by and left such wonderful comments! I hope I can continue to inspire with my projects for 2014. 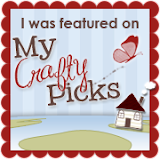 I'm going to push myself to create more videos and tutorials in 2014 ~ after all, Stampin' Up! 's motto is "Inspire. Create. Share"! Melissa, what a great card to end 2013, you did it again. I would like to know/see how you made this card for your Dad, he must have liked it very much. 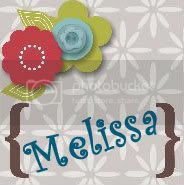 Melissa, your card is stunning! What a wonderful gift for your dad! It is a keepsake.I look forward to seeing what you come up with in 2014. Peace. Yes, please do a tutorial! Gorgeous Card!! This is just beautiful Melissa, so much detail, I know your dad loved it. 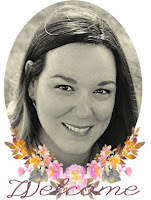 Thanks very much for all of your time and energy it takes to blog and share your creations with us, you definitely inspire us and teach us so much. Happy New Year, looking forward to seeing all you create in 2014! WOW! what a stunning easel card... beautiful scenery! YES, PLEASE DO A TUTORIAL!!! Would love more information. Beautiful card. You have such a great imagination. YES, PLEASE DO A TUTORIAL!! !